Talk about an epic catch! David Confair of Secretary, Md landed a 17.90-pound longnose gar on January 23 while fishing for catfish a few miles above the Brookview Bridge on Marshyhope Creek on Maryland’s Eastern Shore. 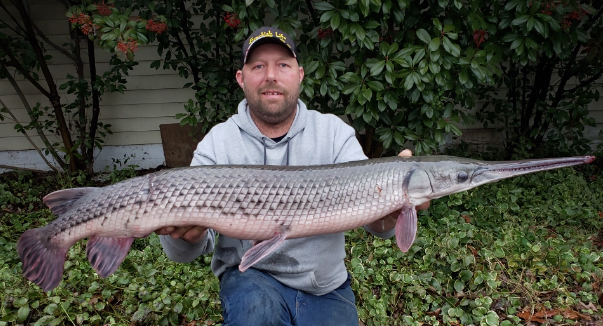 He kept the gar alive for more than two days to allow state biologists to certify it as the new state record, besting the 17-pounder Justin Kelly caught in the Potomac in 2011. Afterward, Confair released the monster back into the creek, telling Maryland’s DNR, “It deserves to live. I’m hoping to set a bigger record. I know there are bigger ones. I’ve seen them.” Joey Harding was also fishing for catfish last week near Marshyhope Creek and landed a huge grass carp. We’ll feel the Arctic fingers of the polar vortex over next couple days, which will lock up many creeks and ponds. But it’ll be nothing like the Midwest, where some parts will feel like the South Pole. Once we thaw out, try for yellow perch in the deeper holes in the lower Susquehanna off of Perryville and Northeast River as well as the western shore tributaries—Bush, Middle and Magothy. Eastern Shore neds (nickname for yellow perch) have been biting in deeper waters. Your best bets are the Pocomoke, Tuckahoe, and Nanticoke, or try the upper Choptank and upper Chester. Minnows and grass shrimp work well with double-rigged shad darts or light jigs. Chain pickerel cannot resist a bull minnow, though spinnerbaits, crankbaits and swimbaits work too, especially for larger fish. Anglers are chasing big blue catfish in tidal Potomac where they are holding in holes and along channels edges. The trophy-sized cats are in the deeper waters. The upper Nanticoke, Chester and Choptank rivers are worth trying, too. Most of the coastal fishing is for tautog over wrecks and reef sites. Winter is when trophy-sized tog are decked. Virginia’s black sea bass season reopens on February 1, but you’re out of luck in Maryland waters where it’s closed until May 15. You’ll need a recreational black sea bass permit from the Virginia Marine Resources Commission (VMRC) to take advantage of the fishery. Only the captain needs a permit, not one for each person on board. The skipper is also responsible for reporting and must also contact the VMRC (800) 541-4646 before leaving the dock and again when returning at the end of the trip. The Chesapeake duck season ended on Saturday, January 26, and man, did it ever fly by for this wing shooter. At the end, the ducks were well educated and wary of landing into any suspicious-looking decoy spread. The Canada goose season ends on Saturday, with the best action coming primarily around mid-morning over fields. Are Eastern Shore Chicken Houses Polluting our Air?